Take A Look At The Kids! 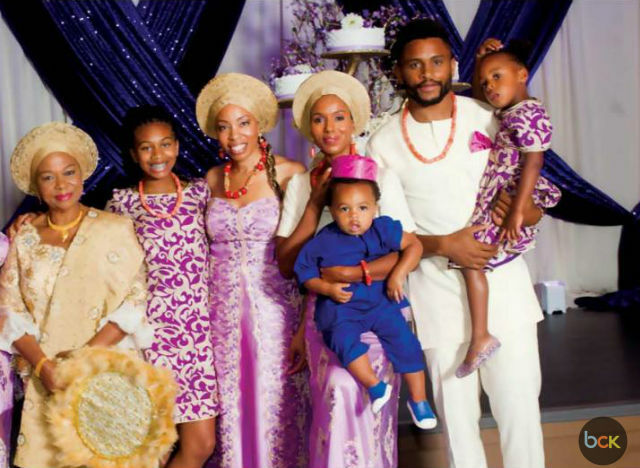 Kerry Washington, husband Nnamdi Asomugha, and their kids were recently featured in the Nigerian society magazine, Life & Times. Keep reading to see the pics! Kerry and her husband were featured alongside other members of Asomugha’s family. The cover was to commemorate the former NFL player’s mother, Dr. Lilian Asomugha, on her seventieth birthday. Kerry joined other members of the family in wearing traditional Igbo attire for the photo session. The celebrity mom’s kids were also dressed in the attire. Can we just take in the sight of the celebrity family, which is a rare thing for Kerry Washington and her party of five? It was just a few months ago that the American Son star revealed that she was the proud mother of three children. “I am a mother of three,” Kerry said as a correction to Craig Melvin of the TODAY show who originally noted that Kerry Washington had two kids. Many social media fans thought that Kerry’s admission was evidence of her and Nnamdi Asomugha welcoming another child. A few online analysts, however, figured that Kerry’s third child was actually her 12-year-old stepchild. In any case, Kerry Washington used her experience as a mom to further understand her role in American Son. In the play, the actress and her co-star, Steven Pasquale, go on a mission to find their missing son. The storyline touches on the subjects of race and politics all while highlighting parenthood. Kerry Washington and Nnamdi Asomugha celebrate their sixth wedding anniversary this year. Stay tuned for more celebrity family news!